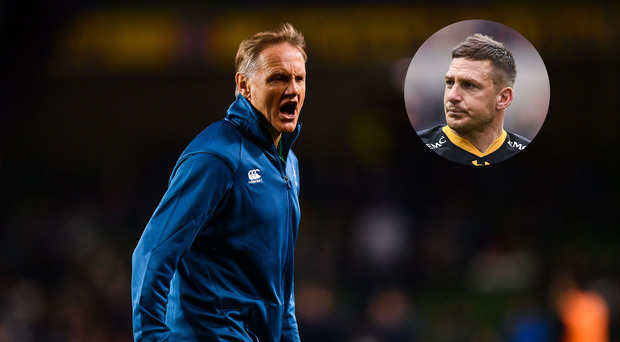 Former Leinster out-half Jimmy Gopperth says Joe Schmidt 'definitely deserves' the chance to coach the All Blacks and has backed the Ireland boss to succeed Steve Hansen after the 2019 World Cup. The Kiwi ten, who played with Leinster for two seasons between 2013 and 2015, thinks that the Ireland head coach is the right man to 'take the reins' with the All Blacks after next year's tournament, with Hansen set to depart the post after eight years in charge. Schmidt's contract with Ireland expires after the World Cup, with the New Zealander set to confirm his future after this month's autumn internationals. The All Blacks are expected to announce their succession plan in the near future too, and many are speculating that Schmidt may finally return home to take up rugby's biggest job. Speaking on The Left Wing, Independent.ie's rugby podcast, Wasps out-half Gopperth said that he feels Schmidt is the right man to take New Zealand rugby forward after the competition in Japan. "It's an interesting one, isn't it?," Gopperth said. "What Joe has done for Ireland and Leinster has been phenomenal. It's pretty hard to knock him down as a coach, he is one of the best coaches in the world. It is funny with those All Blacks coaches, they seem to stay in the system. One goes off and then the next cab in the rank gets pushed forward. "But I think Joe is going to have a massive opportunity to take the reins at the All Blacks and I'm hoping they willl give him a crack because he definitely deserves it. He has been away from New Zealand for a while but he is a Kiwi and I'm sure he would love to coach the All Blacks at some stage."